THE INDUSTRY’S ONLY EPA REGISTERED & NSF APPROVED SANITIZER DELIVERS RELIABLE, EFFECTIVE RESULTS EVERY TIME. 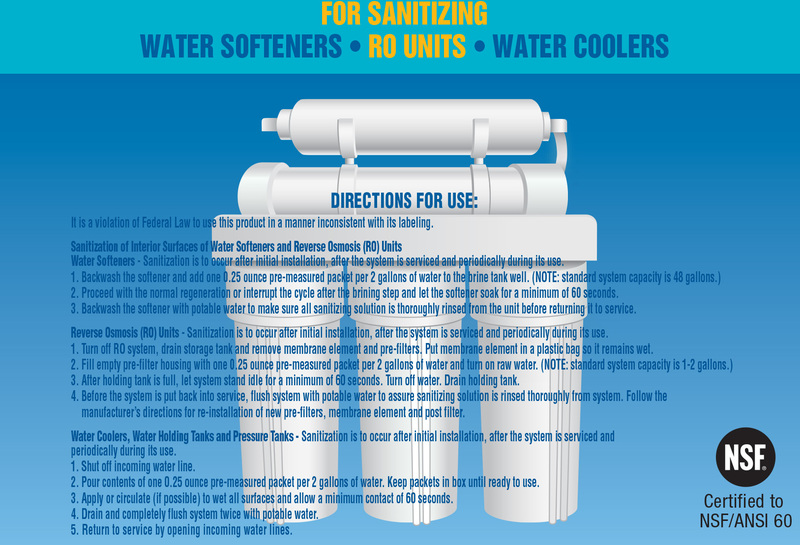 Sani-System Liquid Sanitizer Concentrate is the only EPA registered & NSF approved sanitizer for use in water softeners and reverse osmosis units. It’s proven to kill 99.99% of harmful bacteria without using chlorine, oxidizers or acids that can harm system equipment, parts and resin. Each packet of concentrated formula sanitizes equipment in just 60 seconds and is available in exact pre-measured doses for both water softeners and RO units. Sani-System’s no-mess ease and accuracy answers our industry’s most important sanitizing concerns. Sani-System is effective, efficient and easy to use – it’s as simple as that! Water treatment equipment should be sanitized regularly to maintain quality service levels. If equipment is not properly cared for, bacteria begins to grow and multiply wherever the water sits, including on the inside surfaces of tanks and hoses. Putting impure water in the tank can also be a cause, but over time, bacteria grows — even in chlorinated water. When water sits in a tank or hose, chlorine levels drop, reducing its chemical ability to prevent bacterial growth. Filters can also filter out chlorine, making the water more susceptible to bacterial growth. In addition, system equipment such as hoses, filters and canisters can harbor and help to support bacterial growth. 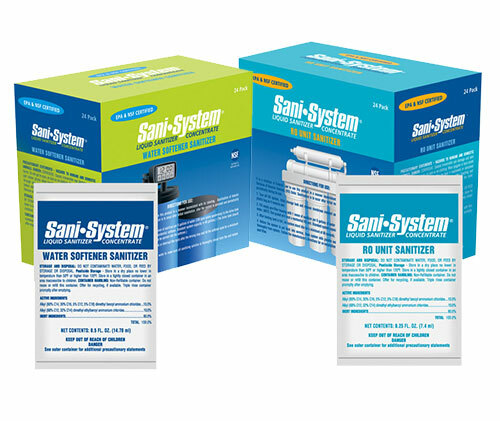 When used as directed, Sani-System kills bacteria such as Staphylococcus aureus (Staph), Escherichia coli (E. coli), Listeria and other micro-organisms that grow on the untreated surfaces of water quality equipment like water softeners and RO units. It eliminates odors and sanitizes tanks, lines and hoses. Specialized products similar to Sani-System are commonly used in restaurants, food processing plants and medical facilities to sanitize drinking glasses, food preparation equipment and other hard surfaces. rubber gloves and store filters and membranes in water to prevent damage. sure pure water faucet is closed and turn on water supply. filters or membrane. Flush the system two times.